34 years ago today, on Saturday, January 8, 1977 I had an awesome day at 30 Rock. Not the show… the building. As I did on most Saturdays during high school I went to the RCA Building (now the G.E. Building) in Manhattan, home of NBC. On this Saturday there was no live edition of “Saturday Night Live,” so I was there for a taping of the new game show “Shoot for the Stars,” with host Geoff Edwards. Unused ticket for “Shoot for the Stars” from January 8, 1977. The show had just premiered on NBC five days earlier and I already had tickets. “Shoot for the Stars” would not last long however; it ran for only nine months. Before the taping I took the NBC Studio Tour – a tour I had taken many times before, and could probably have led that day. 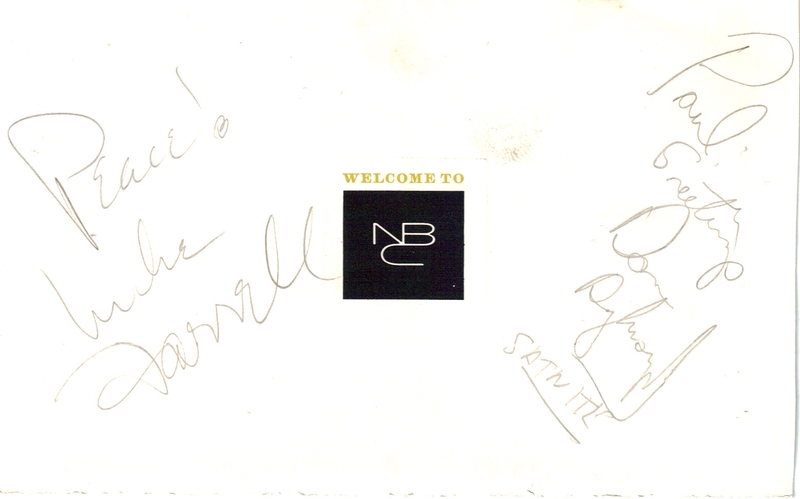 While hanging out in the NBC lobby, between the tour and the taping, I managed to meet two of the decade’s biggest TV stars and get their autographs. My tickets to “Shoot for the Stars” arrived inside this card, which I then used to collect my celebrity autographs. First I spotted Dan Aykroyd looking in the windows of the stores in the RCA Building lobby. He was sloppily dressed and wore a cap pulled down over his eyes, but I could always spot a celebrity from a mile away. 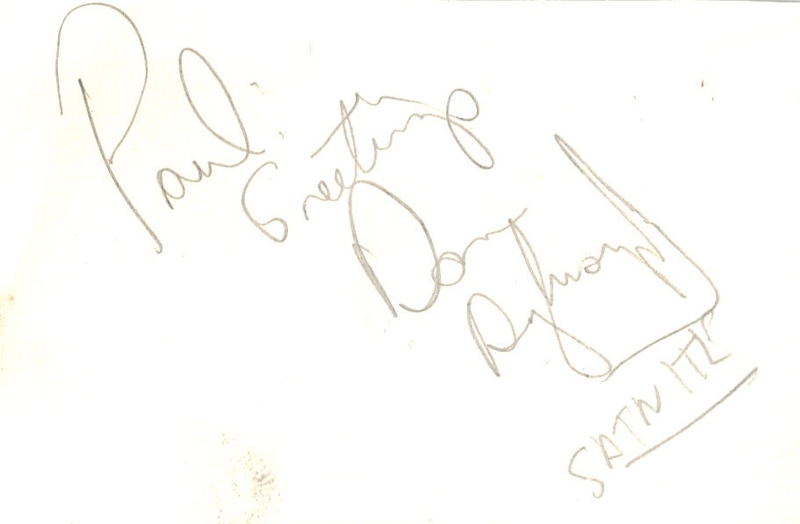 Dan Aykroyd autograph signed at 30 Rock on January 8, 1977. When I asked for his autograph I only had a pencil handy, so Aykroyd’s signature has faded a bit over the years. What I love is that he wrote “SAT NITE” beneath his name… perhaps so that years later I would be reminded who this “Dan Aykroyd” person was. But even if his career had ended that day, I could never have forgotten this incredibly talented man. 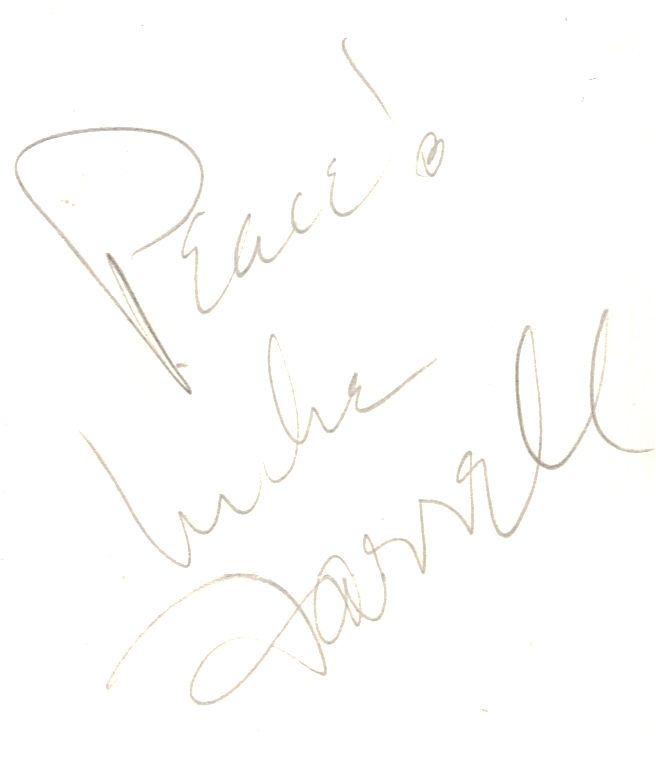 Mike Farrell autograph signed at 30 Rock on January 8, 1977. After meeting those two stars I wanted to stand in the lobby of 30 Rock for the rest of the day, just to see who else might pass through. I didn’t though. I went home with the rich memory of my awesome day at 30 Rock.